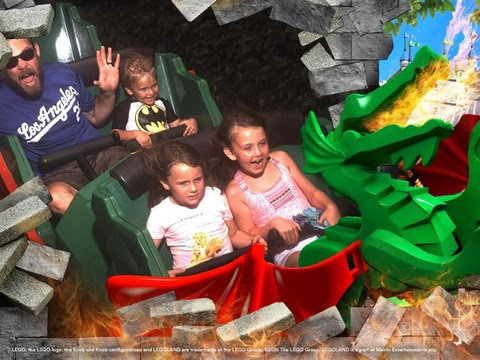 "Best Day Ever.” It was the phrase we heard all day while at LEGOLAND. We spent the first half of the day in the amusement park enjoying, AQUAZONE WAVE RACER, COASTERSAURUS, COAST CRUISE, LEGO NINJAGO RIDE, SPLASH BATTLE and THE DRAGON ROLLER-COASTER. Note: The Ninjago ride lines gets long fast. Go there first if it's important to your kid. One of the kids’ favorite things was to do the Lego Minifigure exchange with the employees. All you have to do is bring a LEGO Minifigure or purchase one at a retail store to trade with any “Model Citizen” throughout the Park. All you have to do is ask! Trade again and again throughout the day. We enjoyed eating throughout the park and, for an added bonus, they had Gluten Free options at most locations for the girls. I would recommend downloading the Moblie App for a Map, character locations, shows and events. 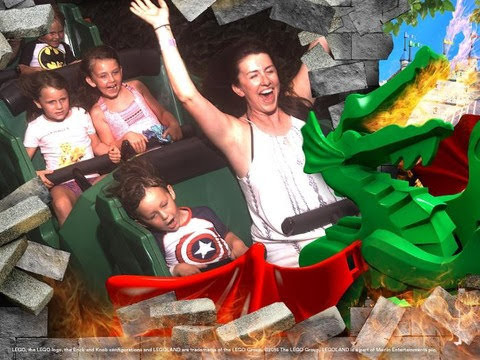 We also did the Ultimate Photo Pass which allowed us to get downloads of all the ride photos, character photos, and a LEGOLAND photo book for each kid. We found it easier to do our shopping right after we went on the Ninjago Ride. Each kids had their own spending money and you can leave your toys and pick them up before you leave at The Marketplace. The second half of the day was spent at the WaterPark. I would recommend renting a locker, as you’re able to bring in drinks, small snacks and any food for dietary restrictions or allergies. The park recommends you arrive at 11am or 3pm to avoid lines and they were right. We were able to walk onto every ride with little to no wait times. We opted not to rent a cabana, as they park is spread out into multiple areas, and we were able to find lounge chairs at every location anyway. The Waterpark stays open till 7pm and we arrived at 3pm. 4 hours was plenty of time and the kids were thoroughly exhausted when we left! Overall, this has been our favorite park to visit and the kids have requested to go back, over Disneyland...win win! !